Where's my Pork Chop? Sorry Danny, but you're not going to get it off me. Not so long ago I attended a very interesting meeting of food bloggers discussing PR engagement. After this contretemps, we all congregated to the pub and socialised over a few bevvies. I got talking to the Food Urchin and he explained to me a little project of getting bloggers to cook him a meal every week. A few beers later, I had agreed to participate. I love cooking, but it scares me. I am far too critical of my own food and care far too much what people think. What the hell had I let myself in for? Anyway, in my minor panic and long deliberations about what I wanted to cook, I decided to resort to a dish I had never cooked before but I knew was delicious, my mothers chicken rice. I never really use measurements, but I have tried to provide them where I can. I mostly cook to taste. 1. Mix the light and dark soy with the oyster sauce in a mixing bowl, add the chicken, season with white pepper and then leave to marinade. 2. Chop the ginger into fine pieces and crush and chop the garlic. Wash and then dry the rice so most of the starch is removed. Fry the garlic and ginger gently so the flavour is released and then add the rice and cook for a minute so the flavour is combined with the uncooked rice. 3. You can transfer the rice into a rice cooker or saucepan. Cook in 2/3rds stock, 1/3rd water. Keep an eye on the rice, it needs to cook halfway. 4. 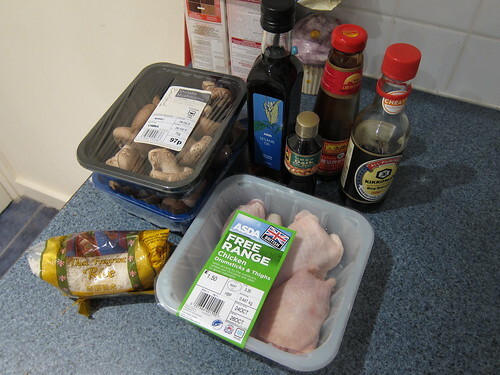 Whilst the rice starts to cook, remove the chicken thigh pieces from the marinade and stir fry on a high heat. 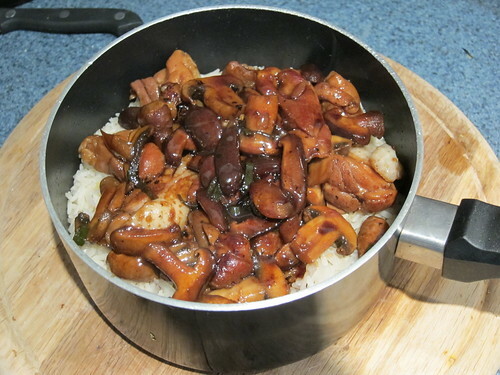 Once sealed, reduce the heat, add the mushrooms and chilli and continue to cook. Add the marinade and some stock until a gravy is formed. Corn starch can be used to thicken. 5. 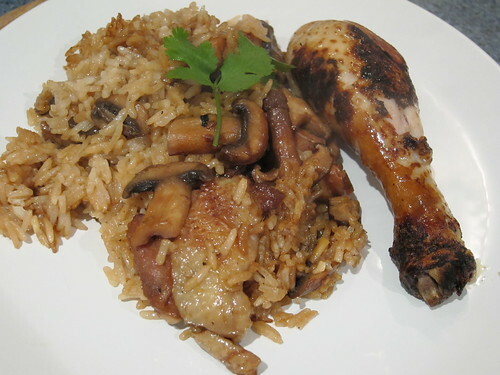 Once the chicken is cooked, add the chicken and gravy to the half cooked rice and continue to cook the rice until it is light and fluffy. 6. Whilst the rice is finishing cooking, fry the drumsticks so the skin crisps up. When the rice is done, serve up together with some finely chopped spring onions and a drizzle of sesame oil. Fingers crossed, this recipe turns out to be as good for you as it has been for me over the many years that my mum has cooked it. Bon appetit! Not the way I've done it, but worth a try! I love chicken rice. In fact, I'm going to find some for lunch tomorrow.